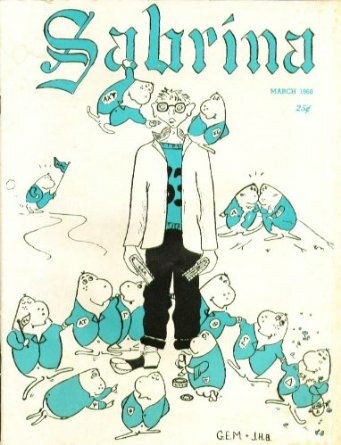 On the subject of David Foster Wallace, today’s treat was coming across four copies of Sabrina, Amherst’s Humor Magazine. The find has little to do with my research but they were still worth a look as the humour is juvenile and silly, in the main, but where would we be without a touch of silliness every now and then? Because I cannot share images from the Wallace collection, here is a public domain image from a 1960 issue. This entry was posted on Thursday, March 12th, 2015 at 2:22 am	and tagged with Austin, David Foster Wallace, satire and posted in David Foster Wallace archive, Satire. You can follow any responses to this entry through the RSS 2.0 feed.